We tinkered with a lot of ideas for Days of the Frozen Throne before it was Days of the Frozen Throne, but none of them felt quite right. So we started looking back at our favorite sets from the Year of the Mammoth. When we were thinking about timing, we figured the event would land sometime around the one year anniversary of the Knights of the Frozen Throne’s launch. Knights of the Frozen Throne was one of our favorite sets from last year, and what better way to celebrate its anniversary than by bringing it back to the game in such a substantial way? This was also when we came up with the term “brawliday”—one Hearthstone holiday event that lasts for the duration of a brawl. At this point, the team was facing two challenges: what to name the event, and how to keep it concise but also have it live up to Hearthstone’s standards. The perfect solution occurred to us during our brainstorms. We were sitting in a room kicking around concepts when it suddenly hit us: we already had (K)nights of the Frozen Throne—what about DAYS of the Frozen Throne? That immediately energized everyone: we went back to our desks and wrote the entire event pitch in one sitting. Meanwhile, we also had to keep the other teams informed of what would go down during this event. One of the first people we spoke to was Josh Harris, one of our chalkboard artists on the Hearthstone team. He’s the guy who makes some of the awesome brawl chalkboards you see each week! We looked at different iterations of the art for the brawl before settling on what you see in the client right now. 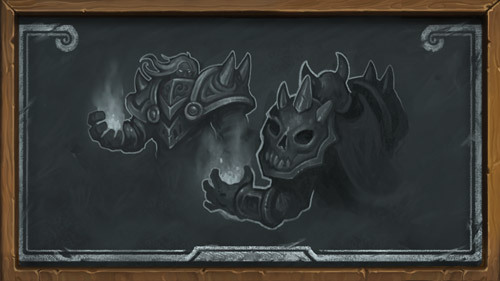 Below is one of the first passes at chalkboard art for Duel of the Death Knights. With Death Knights leading the conceptual charge, it was easy to put to paper exactly how it would work. We wanted players to be able to experience Knights of the Frozen Throne all over again, and we would do that through the brawliday’s quests. And if you’re a new player, or just don’t have all the cards you needed? Well, that was what the brawl is for! The Duel of the Death Knights brawl you see in the Days of the Frozen Throne brawliday was specifically inspired by the Rise of the Zombies brawl. Seeing just how dramatically playing as a Death Knights changed a player’s Hearthstone experience was very inspiring for us. In Duel of the Death Knights, you start the game as a Death Knight and play with a random deck built from Knights of the Frozen Throne cards. This also helped us fulfill another goal we had for Days of the Frozen Throne: to make sure that players would be able to fully experience the Knights of the Frozen Throne card set, especially if they were new. It was also something that we kept in mind when designing daily quests for this event. And of course, in typical Hearthstone fashion, we also have a ton of fun playing with words when coming up with quest names! Plays of the Frozen Throne, anyone? See if you can find them all in-game! We also thought that rewarding a Golden Happy Ghoul on log-in would be a fun way to introduce players to the event. We considered other cards for the log-in reward, but we ended up picking the Happy Ghoul because it just fit the Days of the Frozen Throne theme. This little ghoul making snow angels (snow ghouls?) was one of the most lighthearted cards in the entire Knights of the Frozen Throne set, and also one of our favorite golden animations. And that was how this happy little brawliday, celebrating one of our favorite sets from the Year of the Mammoth, came to be! We want to create more brawl events like this one in the future, as they’re a good way for us to revisit the things we’ve loved from past sets and to give Hearthstone more micro-events. Be sure to collect your Happy Ghoul for logging in, and in case you’ve yet to complete your Knights of the Frozen Throne collection, check out the Bundle Up Bundle that’s available now. See you in the Tavern!